The Randall Museum is a children's museum run by the San Francisco Department of Parks and Recreation. It is located off Roosevelt Street, above San Francisco's Castro district. 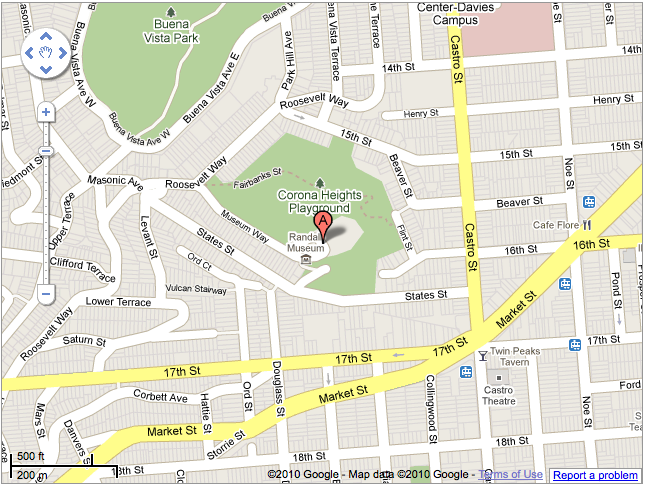 SFAA are temporarily using the Merrie Way Parking lot for the City Star Parties. 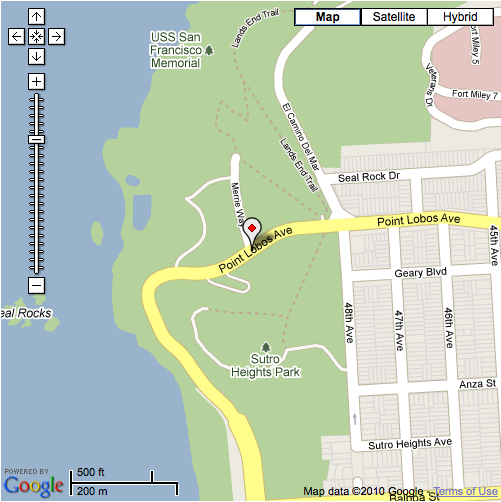 Enter from Point Lobos Avenue to Merrie Way. From Highway 101 take the Highway 1, Stinson Beach exit. 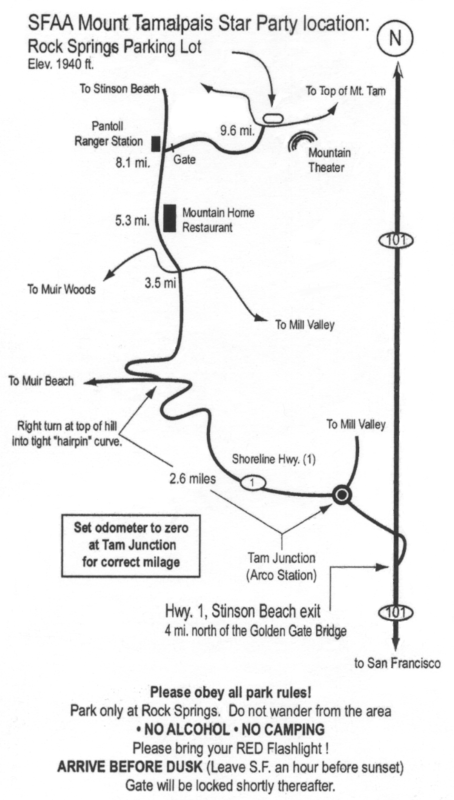 At Tam Junction (the first stop light), turn left onto the Shoreline Highway (also called Highway 1). In about 2 miles turn right onto Panoramic Highway. In another 3/4 miles the road splits 3 ways. Take the middle fork. In about 5 miles the Pan Toll Ranger Station will be on your left. Turn right through the gates across the road from the station and continue for about another 1 1/2 miles to the Rock Springs parking area. Parking is free but limited. Please Car Pool. When you approach the Rock Springs Parking Area, you will find the lot has been divided into two sections by a string of orange cones. Astronomers with telescopes park to the left of the cones, while the general public is asked to park to the right. There will be signs and volunteers to assist you. If the lot is filled, there will be a sign directing you to the upper parking lot. Go past the entrance to the Mountain Theater for about another 1/4 mile. The road will be closed by a gate, and there will be a sign directing you to park in the lot to your right. There is a short trail from the lot to the Mountain Theater. It is recommended that if you wish to observe after the program and you are in the upper lot, that you take the trail back to your car then drive down to Rock Springs for the observing. Some patrons do not stay for the observing, so you should find a parking space. If you have a handheld or automotive GPS unit, we've provided some POI (Point Of Interest) downloads containing precise GPS coordinates for the meeting locations of our star parties. Please consult the instructions which came with your device, or the relevant online forums, for instructions on installing and using these files.